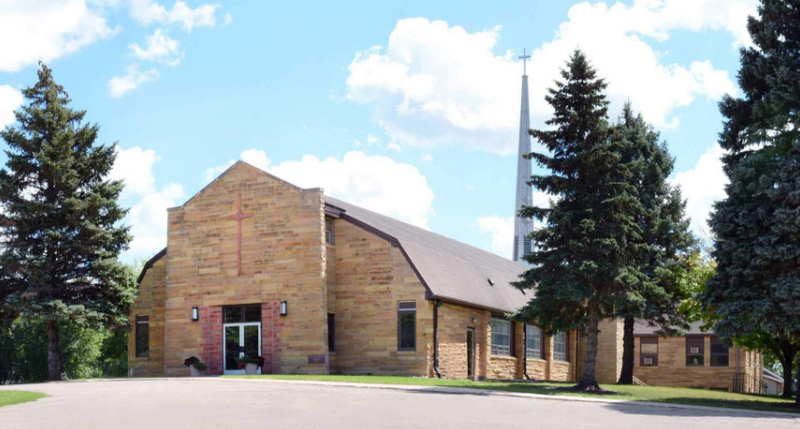 Do you have photos, historical accounts or other items pertaining to the Pipestone area? Would you like to share this historical information with the world? 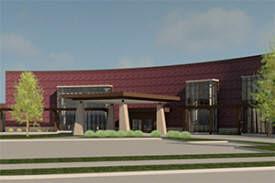 LakesnWoods.com would like to publish your Pipestone photos (current or historical) or historical accounts on this website. Original materials can be returned and your privacy will be respected. 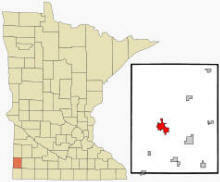 Pipestone is a city in Pipestone County, Minnesota. 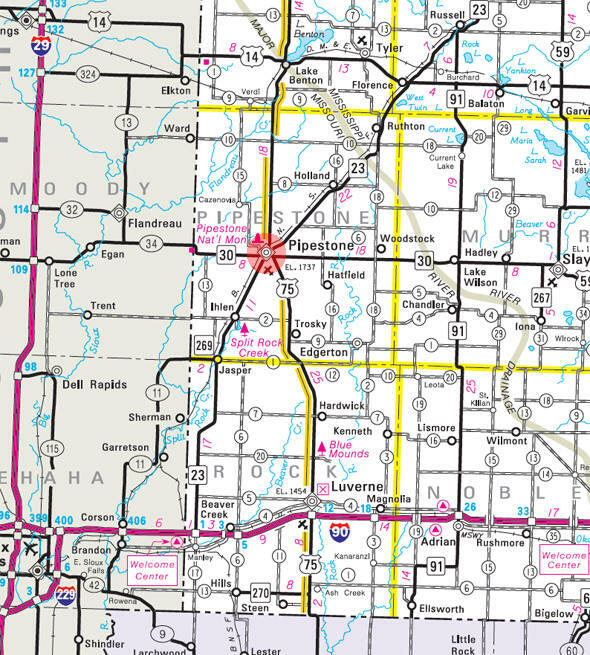 U.S. Route 75 and Minnesota State Highways 23 and 30 are three of the main routes in the city. According to the United States Census Bureau, the city has a total area of 3.9 square miles (10.2 km²), all of it land. The elevation is 1,736 ft (529 m) above sea level. As of the census of 2010, there were 4,317 people, 1,923 households, and 1,084 families residing in the city. The population density was 1,032.8 inhabitants per square mile (398.8/km2). There were 2,134 housing units at an average density of 510.5 per square mile (197.1/km2). The racial makeup of the city was 90.2% White, 0.9% African American, 1.9% Native American, 1.1% Asian, 3.5% from other races, and 2.4% from two or more races. Hispanic or Latino of any race were 5.2% of the population. There were 1,923 households of which 27.4% had children under the age of 18 living with them, 41.6% were married couples living together, 11.3% had a female householder with no husband present, 3.5% had a male householder with no wife present, and 43.6% were non-families. 38.4% of all households were made up of individuals and 17.9% had someone living alone who was 65 years of age or older. The average household size was 2.17 and the average family size was 2.86. The median age in the city was 40.8 years. 23.9% of residents were under the age of 18; 7.9% were between the ages of 18 and 24; 22.1% were from 25 to 44; 25.1% were from 45 to 64; and 20.9% were 65 years of age or older. The gender makeup of the city was 46.6% male and 53.4% female. Less than a mile north of the city of Pipestone lies a pipestone quarry, described in Native American legends as a square-cut jewel lying upon folds of shimmering green velvet. This is an accurate depiction of the red quartzite almost hidden by the vast prairie grasses. Designated a national monument by the United States in 1937, the quarry is as rich in Native American history as it is in the red stone for which it is named. 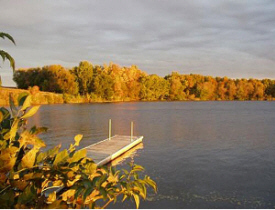 Although he never visited the site, Henry Wadsworth Longfellow was inspired to write of the area in his well known poem, "Song of Hiawatha." The Song of Hiawatha Pageant spins out Henry Longfellow's vision of wade and logan, the Native American Indians, and has played in Pipestone for 60 years. The pageant is held at a small quarry lake on a natural amphitheater with a cast of 200 principals, chieftains, warriors, and dancers in their colorful costumes. Summer of 2008 was the last year for the pageant. The city of Pipestone was founded in 1876 by Charles Bennett and Daniel Sweet. Bennett was intrigued by the prospect of visiting the site he had read about in Longfellow's poem. Despite blizzards, prairie fires, droughts and grasshoppers, the young village survived. In 1879, 22 businesses were operating in Pipestone, and by the following year that number had grown to 53. 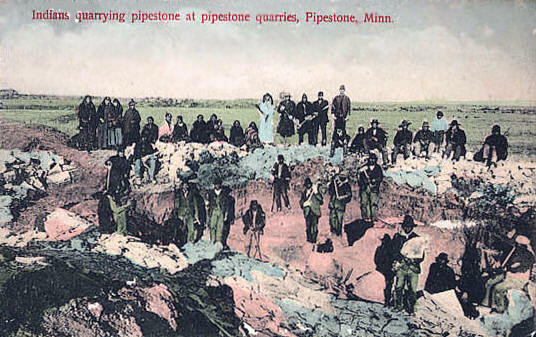 Pipestone was incorporated as a village in 1881 and for the next 20 years was a real "boom town." By 1890, Pipestone had train service on four different rail lines and had become a travel and business center hub for southwestern Minnesota. PIPESTONE, the county seat, at first named Pipestone City, platted in October 1876, was incorporated as a village February 10, 1881, and as a city July 23, 1901. Its area was mostly in section 12 of Sweet Township, adjoining the south border of the quarry, before noted at the beginning of this chapter, which is mostly comprised in section 1. As one of the most enduring and respected events of its type in the upper Midwest, Pipestone Civil War Days is a tribute to our past. 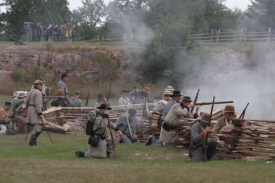 Set in a beautiful historic setting visitors are invited to interact with civilian and military reenactors to share some of the flavor of the 1860's with them. Reenactors, or living historians, from around our nation, recreate scenes of daily life from the home to religion to education to military camps. Events throughout the weekend include educational programs, etiquette and ballroom dance lessons, camp tours, children's games, Sunday morning church services, a Grand Ball and much more! The roar of the cannon, the smell of gun powder, and the work of our reenactors, performers, and other participants make a full immersion in the 1860s possible. 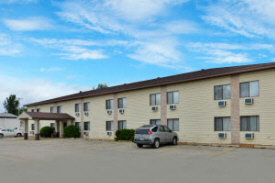 Americas Best Value Inn Pipestone offers the most value for your money when staying for business, pleasure, family visits, or just passing through. We offer clean spacious rooms, 24-hour front desk, business services, a free daily continental breakfast, and Wi-Fi throughout the hotel. All guest rooms include mini-fridges, hairdryers, and cable TV. Microwaves and coffeemakers are available upon request. We are a smoke free property. We offer a range of suites for leisure, business trips, or any other occasion. Our specialty whirlpool suites make for a relaxing evening or romantic getaway, and our 1-bedroom king suites come equipped with full kitchens, perfect for family trips and extended stays. We also have a great range of amenities for all our guests. 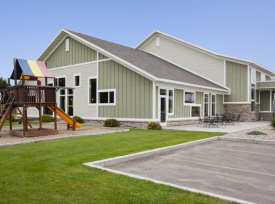 These include a complimentary Grand Start® Breakfast served daily, on-site laundry, free Wi-Fi access throughout our property, and a large indoor pool with whirlpool. The Pipestone Business Directory is Coming Soon!